We’re starting a new competition on the Scratch Pad – luckiest and best golf shots ever. We’ll post two competing shots and you let us know which ones you think is best. Or if you think you have a better one, point us to it. For this round, we have two competing shots – one from the PGA and one from the European tour; one in a tournament, and one in a practice round; both involving water. So, whom would you vote for? You might think that the busiest man in the country would not have time for a nice round of golf, but you would be mistaken. Ever since Taft’s presidency in 1909, all but three men in office have played golf. Mike Trostel, curator and historian at the USGA Museum in New Jersey, reports that many presidents have used golf to cope with the pressures of having one the most stressful jobs in the world. 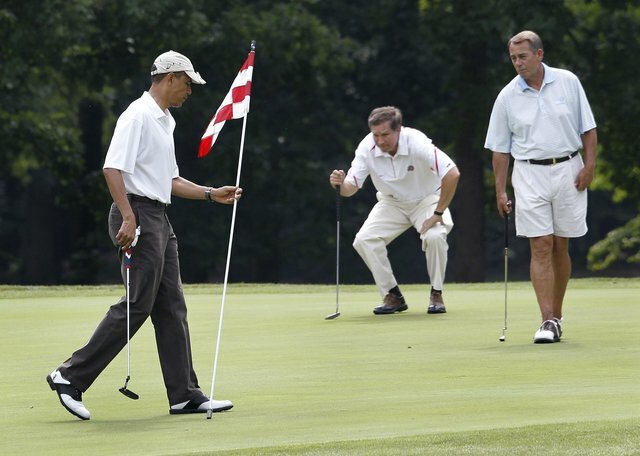 However, golf may be the name of the game, but politics is often the goal. Many commander-in-chiefs have also used golf as diplomacy, as being out on the course can alleviate the tension and conflict of more formal politics settings. 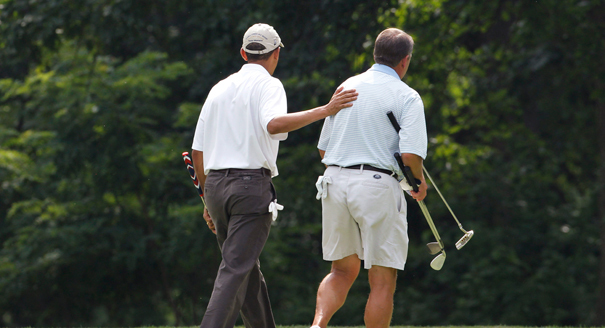 President Obama is no stranger to golf, even teaming up with his political opponents for the sake of the game. In June 2011, Obama teamed up with Speaker of the House, republican John Boehner. They played at Andrews Air Force Base in Maryland, against Vice President Joe Biden and Ohio Governor John Kasich. Unlikely victors, Obama and Boehner beat Biden and Kasich, winning them a whopping $2. Sign of the financial crisis—I don’t know. The scores of the players, like most important things in Washington, are “classified”. It is likely that Boehner, who is #43 on Golf Digest’s ranking of Washington’s top 150 golfers with a handicap of 8.6, outperformed his teammate. Obama is #108 on the list, with an estimated handicap of 17. The most noted golfer out of the bunch is Vice President Biden, who ranks far better than his boss at #29 with a 6.3 handicap. Maybe we can learn something from Golf Summit, as the game was later dubbed. Although a round of golf may not solve all our problems (or our country’s), it can create a better atmosphere for later conversation and dialogue. Grant Dodd is a former professional golfer who now leads Network Ten/One HD’s golf commentary team in all their domestic golf broadcasts providing expert analysis. He also writes for Australian Golf Digest, co-author of Barossa Wine Traveler and more importantly a wine connoisseur. If you are really trying to hone in on your chip shots, grab a glass of wine and watch this video on knocking down wine bottles with pinpoint accuracy. It may be April’s fools (just like the tennis video of Roger Federer), but we’ve heard those guys down under can really dial in their wedges!